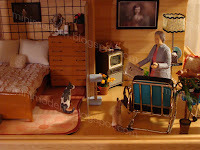 All of the cats in this miniature scene are by Leslie Frick. 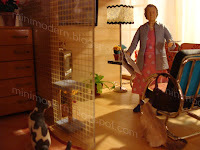 The cat condo is a run-of-the-mill dollhouse store buy. 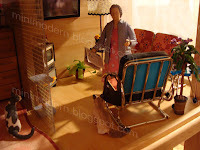 The living room sofa, chair, table and lamp table are by AG Minis. The bed and dresser are marked T.E. (Brownawell?) and the old school TV is a candy toy from Bandai. All of the accessories are from Re-Ment, MegaHouse and AG Minis. The pictures on the wall are from the Kaleidoscope House art accessories. Oh, this is great. Love the cats! If you call this, "Cat House" instead, you might get more hits. Teehee.